Putting aside Canadian Natural Resources Ltd.’s (TSX:CNQ) major Cdn$12.7 billion acquisition in the oilsands mining sector from Royal Dutch Shell and Marathon Oil Corp., upstream M&A deal values in Canada have been extremely low at the start of 2017. In fact, January and February combined saw just Cdn$235 million of new deals, one-fifth of the total in December 2016. However, this slow start could soon be turned around with a large amount of new production placed onto the market in February, according to CanOils latest monthly Canadian upstream M&A review, which can be downloaded here. In total, new asset listings saw 5,600 boe/d hit the market this past month, with the vast majority coming from voluntary listings rather than receivership processes. The higher profile assets for sale are listed below. For full details on these listings and all other upstream assets put up for sale in February 2017, download CanOils monthly M&A review here. 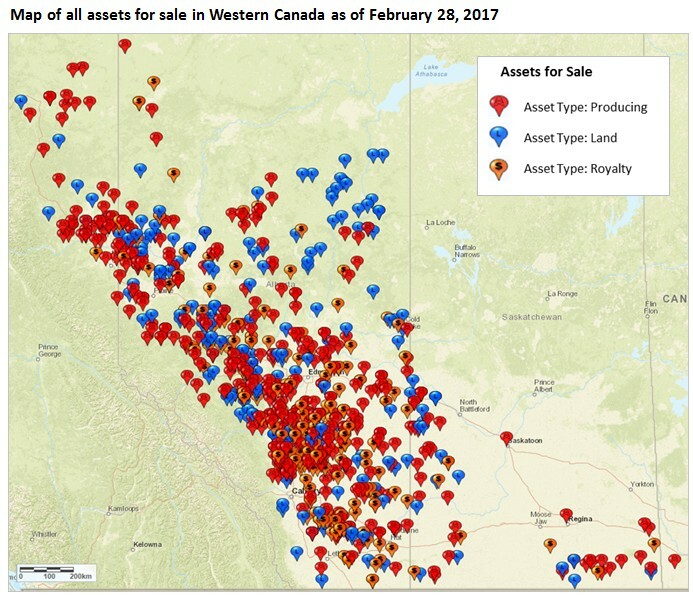 The largest listing of the month by production saw Crew Energy Inc. (TSX:CR) offer assets with 2,063 boe/d on the Alberta-Saskatchewan border. The offering is being conducted exclusively via TD Securities Inc. The assets are characterised by heavy oil production and include a potential 700 boe/d of production from shut-in wells. Crescent Point Energy Corp. (TSX:CPG) has engaged TD Securities Inc. as its financial advisor to divest 3.22% and 10.05% interests in the Weyburn and Midale units, respectively, in Saskatchewan. These assets produced at a rate of 1,202 bbl/d and generated an operating netback of $23.53 per barrel over the 12-month period ending September 2016. Paramount Resources Ltd. (TSX:POU) has retained CB Securities Inc. as its exclusive advisor for the sale of several non-core properties in multiple areas of Alberta and British Columbia. In British Columbia, the company is looking to sell assets in the Sunrise and Cutbank areas. In total the assets produce 813 boe/d (57% gas). For more on the CanOils Assets for Sale product, click here.